Born June 2nd 1983, Gabriel Barathieu spends his childhood alongside the Atlantic ocean in the family house located in the Landes, steps away from the ocean. It’s in 1999, on the Reunion Island, that he discovers the wonderful underwater world. 10 years later he decides to make it home. 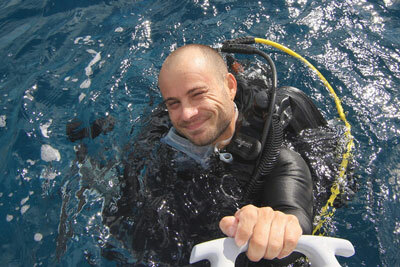 Once back, he rediscovers the beauty of scuba diving getting his level 1 and 2 certifications along the way. Very quickly he feels the indescribable needs to share those hidden treasures hiding under the water through his lens. He first invested in basic material: a small Canon compact camera with a housing. Still not very at ease with the photography part, he senses quickly that underwater photography his becoming a second passion. Perfect sequel to discovering the underwater world. Several hundred dives and a few thousand pictures later he became a rebreather certified diver and discover bubble free diving in 2013. He then gets his Trimix Normoxique certification that allows him to dive up to 70m. Sadly, he suspends his deep diving activities in 2015 after the death of a friend and instructor in an accident. Following the tragic accident, Gabriel quit his job in the public work sector and totally focus on photography. He then participates in prestigious photography competition and gets recognition very quickly. He is also published in various specialized magazines like Plongez, Tauchen, EZdive, Practical Photography, Science et Vie, GEO or National geographic. Forced to resume his former job after 2 years, Gabriel decides to set camp on the island of Mayotte and its magnificent lagoon. More than ever he follows his dream to make a living through his passion and starts deep diving again. Since June 2017, Gabriel spends most of his dives in the twilight zone more commonly known as the TWILIGHT ZONE. This is a very little diving area because of its difficulty of access. Not to mention the technical aspect of these dives, a few minutes to 120 meters deep cost several hours of decompression. Discover the photos that are as new as they are rare in his album: Deep dive: discover another world! At the end of 2016, Gabriel has the tremendous honor to join the Subal Pro Team (a high-end housing manufacturer). He then became part of a select group, the best underwater photographer’s in the world, alongside guys like Brian Skerry from National Geographic or Alex Mustard to name a few. In 2017 he won the Underwater Photographer of the year in the underwater photography category. This very coveted title by all the underwater photographer of the world and his newly integration to the Subal Team motivates him like never to live his passion: underwater photography. A TV coverage on Gabriel Barathieu, underwater photographer of the year 2017, specialized in underwater photography, scuba diving and wonderful natural landscapes. TV report broadcast on France O, in the show "The witnesses of overseas".